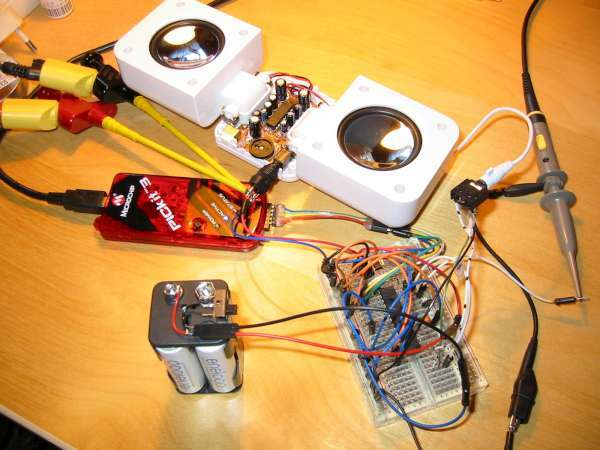 Markus built a DIY music box from some old speakers and a PIC32 microcontroller. The uC generates the sound, and the amplifier that’s integrated into the speakers amplifies it. This entry was posted on Thursday, January 19th, 2012 at 9:00 pm	and is filed under project logs. You can follow any responses to this entry through the RSS 2.0 feed. You can skip to the end and leave a response. Pinging is currently not allowed. It is beautiful and lovely. I’m impressed! You should take your project down because it is obviously commercial quality.